Welcome to the snake case of the Fauna Room. Photos are from A Field Guild to Snakes of Florida by Alan Tennant. 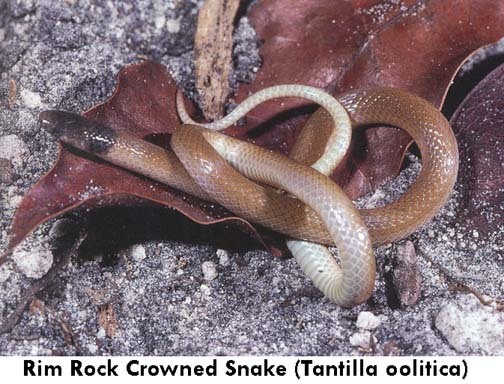 This is a very venomous reptile. The saying is "Red touches yellow, kill a fellow. Their prey is other reptiles chiefly other small snakes, even cannilbalism. 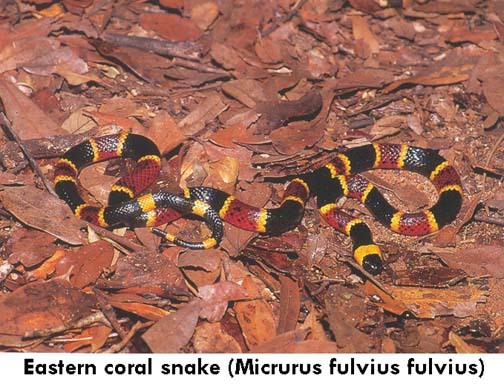 Their color rings completely encircle the body and scheme is equally wide red and black rings separated by a yellow ring. Only black and yellow are found near the tail and head. This is nonvenomous reptile that does not bite humans. They have been found on Key Largo, Upper Matecumbe and Grassey Keys. Lack of habitat is their demise. Their prey is insects, snails, centipedes, spiders, etc. The record size is 11.5 inches. 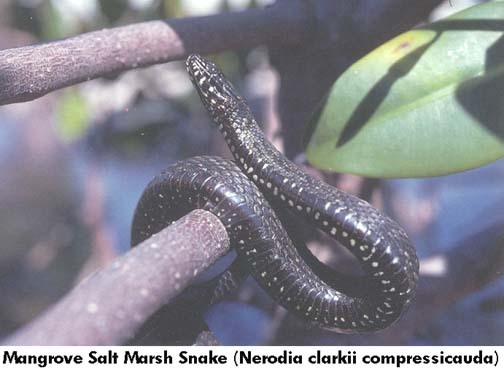 The Mangrove Salt Marsh Snake are varibly colored reptiles. They can vary from tan to almost black including redishtan and greenish tan.. They are found in brackish and saline waters on offshore islands as well as roadside canals. Small fish and crayfish are its primary diet. 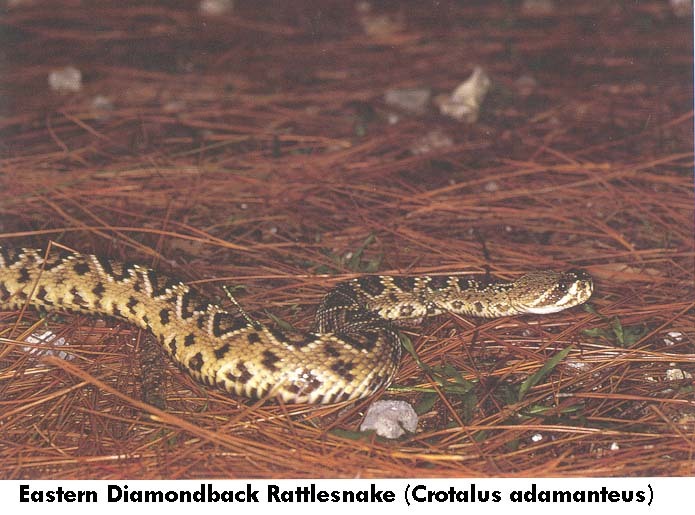 Generally considered the most dangerous venomous snake in Florida. 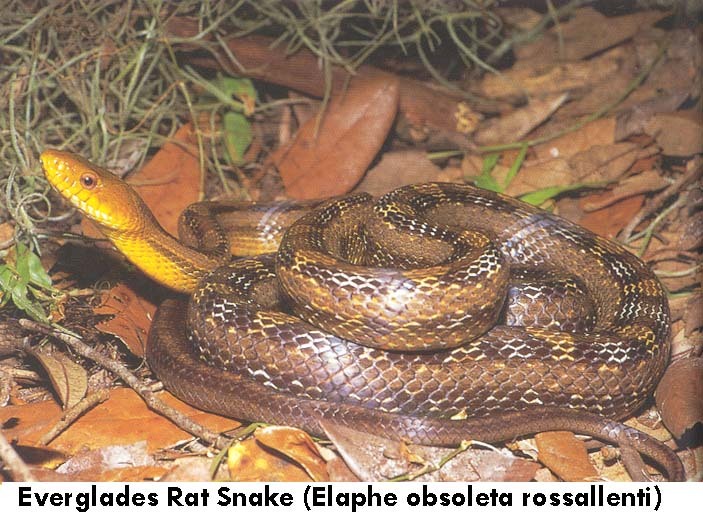 They are strong, agile and can easily strike three feet and usually delivers a large amount of venom. Its prey is any small warm-blooded animal. The snake shown above is the Upper Keys Deckert variant. This snake also is an varibly colored reptile. The Upper Keys variant is more likely to have brown or orange back patches. They are excellent swimmers and climbers. Birds, rodents, lizards, frogs and their eggs are generally their food source. They are also a powerful constrictor.